P/b, 19 x 24.7cm. 16p. Published by the Red Cross and St. John War Organisation. This is a period facsimile of a manuscript illuminated by R.A.F. Sergeant James W. Lambert in Stalag Luft VI and was printed in 1944 for fund-raising purposes. The book is in the form of a prospectus of study from a 'Barbed Wire University whose only qualification for entry is to have faced death'. Schools were set up in many camps in order to combat boredom and provide a way to improve qualifications, learn new skills and prepare the men for the 'after-war' period and re-entry into civilian life. Contrary to popular belief not all p-o-w's were hell-bent on escape and sought other ways to pass the time. 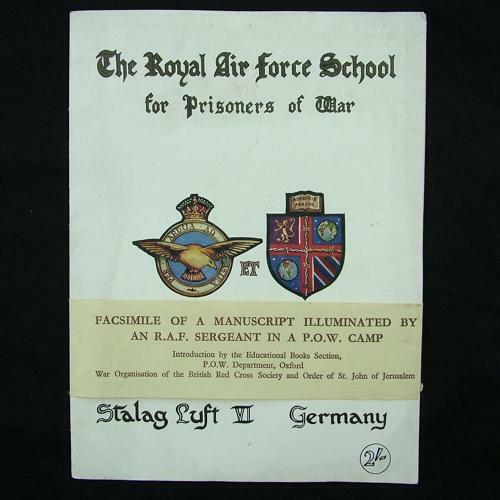 Within Stalag Luft VI, a camp of 4,686 prisoners there were 4,259 in classes with 23 subjects initially being taught (later expanding to 84) and 17 study groups provided for professional examinations. Books were sent into the camps by the Red Cross. The initial subjects covered ranged from Mathematics, Physics and Chemistry to Botany, Navigation, Book-keeping and Hotel Management. The book is in quite good overall condition but has light creasing, bent corners and minor soiling. Comes with the original paper 'sleeve'. Now rare to find. Stock code P23211.